The Tosa Inu is a very bold, brave and intelligent breed. This breed has friendly and affectionate nature which makes them a favorite among breed owners. They are complete housedog. This breed of dog is alert and suspicious of strangers and warns their owners of danger by barking intensively. The Tosa Inu is a very brave and intelligent breed and are a favorite amongst the people owing to their loving nature. This breed is very loyal and seeks attention from their master and can become destructive if they are left alone for long period of time. This breed is easy to train but early obedience and socialization is required. They are not good with other pets that they do not know. They are not recommended for inexperienced owners. This breed of dog has single coat which is short, dense and straight. They are an average shedder. The Tosa Inu is a good learner and can learn quickly. However, the training should be given with patiently, firmly, fairly and consistently as they will not respond to harsh methods of training. This energetic and speedy breed loves to go for a walk and enjoys family play session. This breed requires consistent exercise to be fit. Their grooming is very easy. They require occasional brushing but bathing needs to be done only when mandatory. They will survive in apartments provided they are given sufficient exercise. 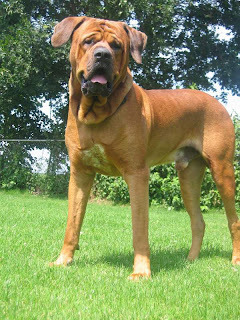 This breed tends to live for 10 to 12 years and does not suffer from any known health problems.